Flanked by law enforcement officials and community activists, a state senator vowed Tuesday to make improving safety on the Coronado Bridge a top priority in response to a suspected DUI crash that killed four people. “We’re all still in shock over the events of this past Saturday,” Sen. Ben Hueso said at Chicano Park, where a pickup truck landed amid attendees of a popular motorcycle rally after vaulting off the landmark span over San Diego Harbor. Hueso, D-San Diego, said he and other local leaders intend to “ask for answers and look for solutions” to prevent a similar tragedy from occurring. The Coronado Bridge defines the San Diego City skyline, and serves as a major artery connecting residents to jobs and other amenities — but on Saturday, “that artery failed us,” Hueso said. The bridge, he added, failed to provide safety and has become synonymous with a loss of life, not only from vehicle crashes but from suicide. “We’re wondering if our community is safe,” Hueso said. While the community stands united in mourning over the tragedy, residents also want action, he said. Hueso said a letter to Gov. Jerry Brown asking for more resources to improve safety on the bridge, including suicide prevention. “We have to make sure the bridge is safe for the people above and the people below,” Hueso said. The senator said he will also look into funding for improvements such as guardrails or increasing the height of the sides of the bridge. Cmdr. Jim Nellis of the California Highway Patrol told the crowd an investigation into the crash is continuing, but the blood-alcohol level of the DUI suspect, 24-year-old Richard Anthony Sepolio, was not available as of Tuesday. Sepolio, who remains hospitalized, is expected to be arraigned Wednesday on charges of felony DUI and vehicular manslaughter. According to the CHP, the late-afternoon Saturday crash occurred when Sepolio, a Coronado-based Navy petty officer, lost control of his GMC pickup while trying to merge from northbound Interstate 5 onto the bay bridge. 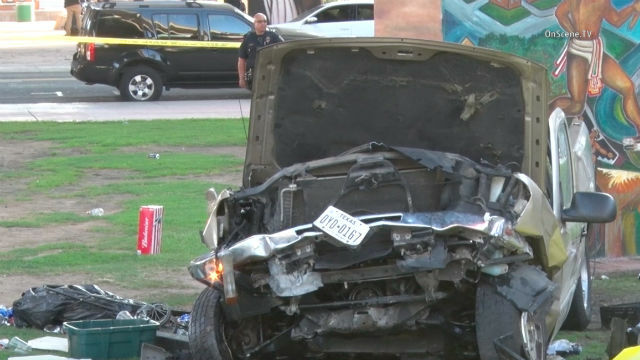 The vehicle plunged about 60 feet onto the crowded park below, fatally injuring Annamarie Contreras, 50, and Cruz Contreras, 52, a married couple from Chandler, Arizona, along with Hacienda Heights residents Andre Banks, 49, and Francine Jimenez, 45. All four were pronounced dead at the scene. Nine others, including Sepolio, were hospitalized for treatment of various non-life-threatening injuries. Because of the dynamics surrounding the crash, the investigation will take months to complete, Nellis said. Nellis said Sepolio has a minor offense on his record from Texas, but it was not DUI-related. Pablo Trevino — owner of the magazine Vatos Y Viclas, which organized the Saturday motorcycle event — told the crowd a vigil for the victims will be held at 7 p.m. at the Wagon Wheel club, located off Pico Rivera in Los Angeles. He said money is being raised to help those injured in the crash and family members of the deceased. Sepolio, an aviation electronics technician, has been assigned to Helicopter Sea Combat Squadron 6 at Naval Air Station North Island since September 2015, a year after he enlisted, according to the Navy. This story was updated at 5:07 p.m. to include additional comments from officials.